I haven't written on this blog for a very long time, mainly because I didn't need the blog to help me remember (a day doesn't go by that something doesn't remind me of my loved ones who are gone) or to heal. I don't think healing is the exact word I want, but it will serve. One never really gets over loss, but you do learn to live with that black void that tends to follow you around. It lurks like a ghost, just on the edge of your emotions, ready to reveal itself on a moment's notice, blindsiding you with the weight of the grief you thought you had come to terms with. Toward the end, she had several more strokes and could not talk or really move much. But I think, when I looked into her eyes, she knew me. I hope so anyway. And I hope she is with Ron and Dad. Below are a few details we shared about Mom at her funeral, though it is very hard to honor a life in a few short paragraphs. I do hope to write a book about growing up...mainly because I want to get things down, before I forget too! 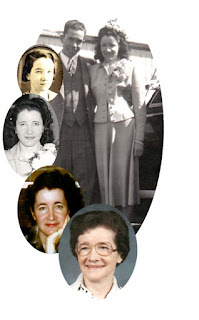 June was born June 10th, 1923 in Salem Ridge (Germantown), Kentucky to Ira Disher Hicks and Carrie Kemper Woodward. 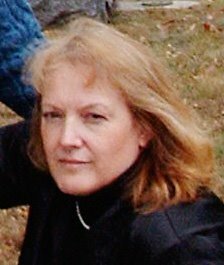 The youngest of three siblings, she often spoke fondly of her early years growing up on the farm and of her memories of family and friends. Her sister, Hazel was a quiet, soft-spoken girl who preferred books and music to romping and adventure. June suffered through her piano lessons, always eager to join her older brother Norman on adventures or playing games outside when they had time away from chores. June was a bit of a tomboy. In later years, June's tomboy personality found an outlet in watching baseball, football, and basketball on television along with the occasional wrestling match or roller derby. June learned the meaning of working hard and hard work from her father. She recalled, once when she was quite young, maybe four, the whole family was working the fields -- they grew tobacco as well as had dairy cows, etc. -- and June sat down in the fields and proclaimed she was tired. Her father got off the wagon, paddled her behind and sent her right back to work. She said after that, she never ever said she was tired again. During WWII, she left the farm and moved to Dayton, Ohio where she became one of the many women answering the call for war effort workers. As one of the "Soldiers Without Guns," she worked for NCR (The National Cash Register Company) assembling bomber engines. It was while working at NCR that June met Grover Noe. He started working there shortly after returning home from the war. On March 27th, 1948, June married Grover Cleveland Noe in Lexington, Kentucky. June then had to quit NCR because, at the time, the company had a policy about married women working there. She discovered shortly thereafter, that she wasn't cut out to be a stay-at-home mom/wife, and actually enjoyed working outside the home. So, June went job-hunting. She had a short stint working for a factory that sewed garments for a retail store, before being hired by The McCall Pattern Company in Dayton, Ohio as a handfolder (folding patterns by hand). She worked at McCall's until the early 1960s, when Grover bought a full service Texaco service station in Phoenix, AZ and moved the family west. Grover's brother Bill and family moved with them. Bill worked for Grover in AZ. The station was called, "Grover Noe's Texaco." June ran the office, and Grover ran the service bays/pumps, etc. In 1967, they sold the station and moved back to Dayton, and June was rehired by McCall's. In 1970, McCall's moved to Manhattan, KS and June came along as a trainer for the handfolding department. She eventually became supervisor over handfolding, holding that title until her retirement. June was an avid walker, sports fan, loved puzzles of all kinds, chocolates, and animals. Later in life, when an ailing hip kept her from walking, she'd take great pleasure in watching the squirrels and bird feed in the backyard. As a child, she had many pets including a squirrel she'd befriended. Before leaving AZ, Ron and Sheri were given a large white rabbit they named Snowball. June taught the rabbit to follow her around the house and to actually use a newspaper for its business. Snowball and June's Chihuahua, Peaches, became reluctant friends in competition for June's attention. On the move back to Ohio from AZ, both rabbit and dog traveled with the family, claiming spots on the seats. At one restaurant stop, Snowball and Peaches managed to get out of the station wagon and somehow made it inside the restaurant and ran right to June at the table. Ron had to smuggle the rabbit out under his shirt while June placed Peaches in her pocket. Animals loved her. During World War II, Dayton, like many other American cities, was heavily involved in the war effort. 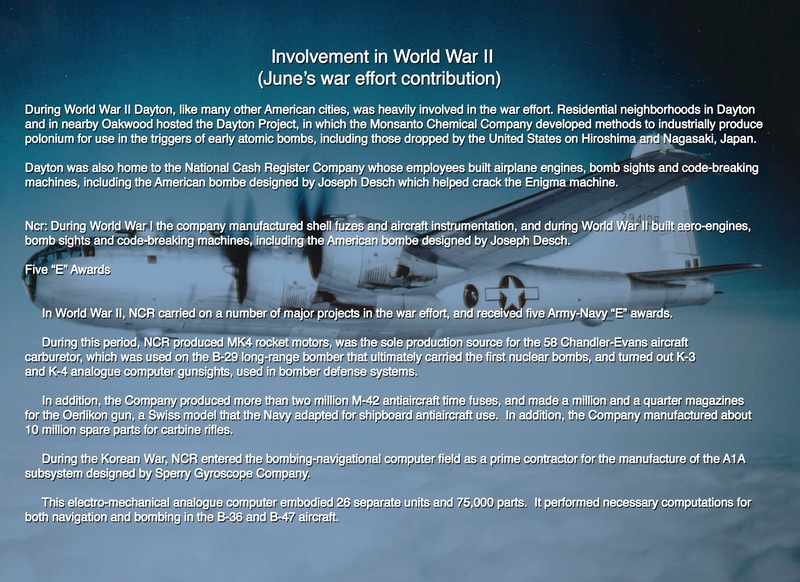 Residential neighborhoods in Dayton and in nearby Oakwood hosted the Dayton Project, in which the Monsanto Chemical Company developed methods to industrially produce polonium for use in the triggers of early atomic bombs, including those dropped by the United States on Hiroshima and Nagasaki, Japan. 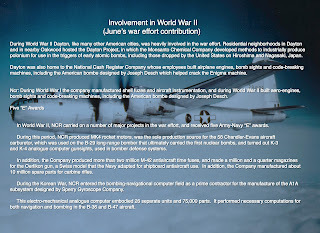 NCR: During World War I the company manufactured shell fuses and aircraft instrumentation, and during World War II built aero-engines, bomb sights and code-breaking machines, including the American bombe designed by Joseph Desch. In World War II, NCR carried on a number of major projects in the war effort, and received five Army-Navy “E” awards. During this period, NCR produced MK4 rocket motors, was the sole production source for the 58 Chandler-Evans aircraft carburetor, which was used on the B-29 long-range bomber that ultimately carried the first nuclear bombs, and turned out K-3 and K-4 analogue computer gunsights, used in bomber defense systems. In addition, the Company produced more than two million M-42 antiaircraft time fuses, and made a million and a quarter magazines for the Oerlikon gun, a Swiss model that the Navy adapted for shipboard antiaircraft use. In addition, the Company manufactured about 10 million spare parts for carbine rifles.